This month of non-stop blogging is turning into a 2010 adventure recap, so I guess I'll go chronologically. 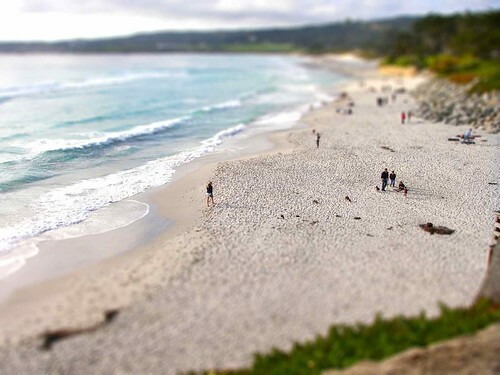 In May we visited Carmel for the first time. We've been to Monterey and Pacific Grove many times, but for whatever reason Dave and I had never actually been in Carmel. We were there to attend a wedding. Not just any wedding, but a cowboy-themed Jewish vegetarian wedding on a cattle ranch in Carmel Valley. The wedding was fantastic and memorable, and we returned to our hotel slightly sunburned and smelling of wood smoke, with wonderful klezmer, bluegrass and traditional Celtic music looping through our heads. Let's just say the band was a versatile crew. Some of the best trips we've taken in the past ten years were for weddings. I shudder to think that I might never have gone to Hawaii (!!!) if not for a wedding. A wedding took us to Mendocino for the first time. And we even had a blast exploring Columbus, which we certainly would not have had the opportunity to do if friends had not gotten married there. It makes me wonder how Dave and I would choose to get married if we were doing it now. Back in 1997 (again: !!!) we didn't have strong opinions about what our wedding would be like; we just wanted to get married and have fun. Now I can imagine a dozen different scenarios involving tropical islands, mountaintops, grassy meadows, nightclubs, redwood groves, intimate bistros and beaches. Any one of them would be great. Not that I have any regrets about our great little wedding in a grand old house in Chicago's Gold Coast. It just feels like it was so long ago, I can hardly remember any details. Of course the details don't really matter -- it's the 13+ years of wedded bliss that count, right? But if I were to do it again, I'd definitely hire a klezmer/bluegrass/Irish band. Even Columbus gets included!!!! I think the ice cream helps.